We explore the complexity of computing tilings of orthogonal polygons using colored dominoes. A colored domino is a rotatable 2 × 1 rectangle that is partitioned into two unit squares, which are called faces, each of which is assigned a color. In a colored domino tiling of an orthogonal polygon P, a set of dominoes completely covers P such that no dominoes overlap and so that adjacent faces have the same color. 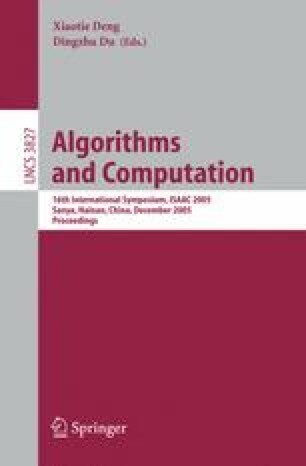 We describe an O(n) time algorithm for computing a colored domino tiling of a simple orthogonal polygon, where n is the number of dominoes used in the tiling. We also show that deciding whether or not a non-simple orthogonal polygon can be tiled with colored dominoes is NP-complete.